I knew I would somehow use my wide angle lens in today’s shot, just didn’t know what the shot would be! It’s (still) been nasty weather wise here (rain and rain and…more rain) but I was determined to get this shot. So there I was, on the corner of our street (under my umbrella of course) waiting patiently for a car (or two) to go by and they just were not cooperating with me (silly cars). So what do I do? Ask Amy to hop in the car and drive around the block a few times. Great shot David! I have a question though …. You didn’t mention this being a composite of different shots. So, where are the wheels? What she flying? LOL I just had to ask! That totally brought a smile to my face! It’s not a composite but a prolonged exposure photo, it’s amazing what a prolonged exposure does as you can’t even see the car! Love everything about this shot — composition, details, creativity etc. Very nice POV and exposure time. Everthing works well together. Great job! Awww, thank you so much Emily! Great shot David, wonderful idea! 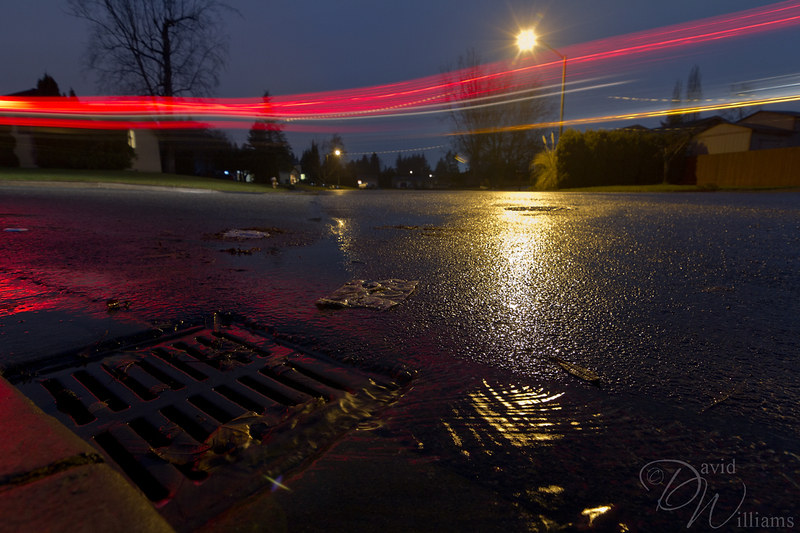 It takes the typical brake light long exposure shot in a completely new direction! Thanx Jim, I originally had something else in mind which I plan on doing whenever the rain stops! It requires me to be in the middle of the road (low PoV shot again)…perhaps this summer! What an excellently creative shot of a drain! The light trails defenately add to this image. Very nicely done! I like the lens flare, as well as all the reflected light on the road. Good on you for braving the wet and getting down low! Excellent!! I like all the little details! I am glad you didn’t remove the lens-flare, it definitely adds to the image. I think you’re braver than I am with your camera and the wet conditions!!! Very nice shot. And very brave of you to have your camera gear out and that close to the ground on a wet day. Thank you for stopping by and for your comment! I think it’s rather neat that we chose the same naming convention for our WP URL! Very nice! I love the slow shutter use here. The red smear of the lights totally makes the image. This is an awesome low POV shot I have seen in a while. I like this long exposure shot. Long exposure with f/11 has captured quite a bit of details in this shot – like the texture on the gravel road, smooth flow on the water, trails etc. Gives the feel I am sitting there by the drain.